It’s easy to understand why you might fail to save much money when you are young. By the time you start working, you may be in your thirties and burdened with a substantial amount of student debt. Making matters worse, you have worked long hours for many years in school and during your residency. You are now ready to reap the rewards of your efforts and assume the lifestyle that is supposed to go hand-in-hand with being a doctor. There is, however, a substantial cost to not putting aside some money in the early years of your career. That’s because every day you put off saving, you lose out on the power of compounding return rates. Let’s say you want to be a millionaire by the time you retire at sixty five. If you start saving at 30, you have to save $698.41 a month. 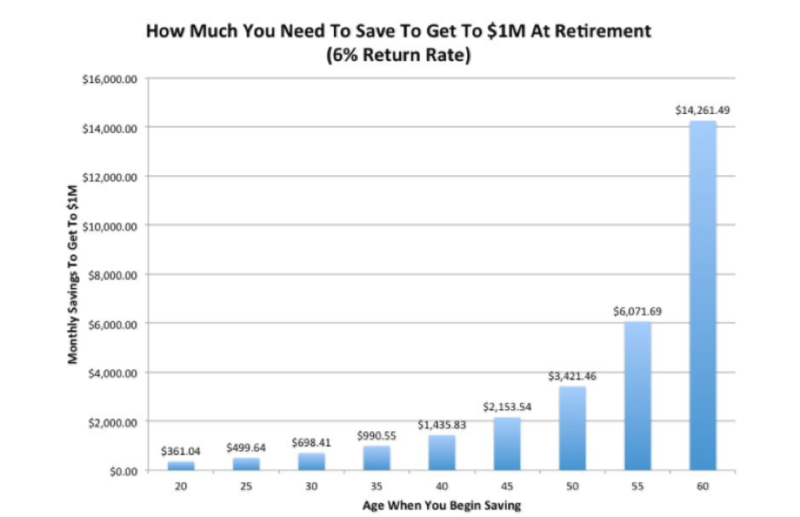 If you postpone saving until you are 40, however, you have to put aside $1,438.83 a month. Think about that for a minute. If you wait until you’re 40 to start saving, you have to squirrel away about $740 more a month for the next 25 years just to catch up. A ten-year delay more than doubles your monthly savings requirement. For insight into the impact of some alternate timing scenarios, check out the chart below. When it comes to healthcare and medicine, doctors know a lot. But their busy schedules often leave them with little time to manage financial investments. Fidelity looked at the percentage of money that more than 5,000 doctors allocated to the stocks in their portfolios versus what the company recommended. [i] The amount they recommend allocating to stocks varies depending on someone’s age. They suggest people invest a higher portion of money in stocks than bonds when they are young rather than when they are nearing retirement. Doctors in their thirties tend to be on the low side of Fidelity’s recommendations with their stock investments — they have less than 77 percent in stocks versus the recommended 87 percent. However, they are not likely to scale back enough on stocks as they near retirement, ending up with too much of their portfolios in assets that are more likely to be volatile — 64 percent in stocks versus Fidelity’s recommended 40 percent. As physicians edge closer to a period when the money will no longer be rolling in, that’s a risky investment strategy. There’s more to financial planning than budgeting, saving and investing. Of course, you need to plan for life’s significant events, such as your children’s education, buying a home or vehicle and retirement. Beyond that, you also need to think about risk management and tax planning. If you work hard to build a nest egg and to save for life events, you cannot afford not to protect your property and earnings potential. While most doctors maintain coverage to protect against risks to their homes and automobiles, some fail to consider issues that might negatively impact their future income. However, what would happen to you and your family if you could not work for a short or extended period of time? How would your loved ones fare if you passed away unexpectedly? While these are subjects most prefer not to think about, it’s best to deal with them and then rest easy, knowing your finances will be taken care of no matter what. So consider investing in disability and life insurance. Failure to plan to minimize or defer what you owe Uncle Sam can also impact your financial well-being. Tax planning is essential for doctors because they have high salaries, so taxes can quickly become a significant expense. One way to reduce tax liabilities is to maximize pre-tax contributions to your retirement plans. That means all the money that escapes taxation today can accrue the benefits of compounded returns. When you withdraw the money after retirement, you are likely to be making less money and to be in a lower tax bracket. Other ways to lower taxes include charitable donations and taking advantage of home mortgage interest deductions. Lastly, if you have your own practice, there are many business expenses you can deduct. So start saving today, ask for some investment advice, buy the necessary insurance to protect yourself from unexpected events and work with your tax accountant to determine the best strategies to minimize your taxes. Taking these steps can help to ensure a sound financial future.